Years after the date that continues to live in infamy, John Sanford Baird remembers the ordeal. At about 8 am on the morning of December 7, 1941, I stood on the third-floor deck of a red brick barracks that looked across the Schofield Barracks golf course toward the infantry barracks that housed much of the U.S. Army then stationed on the island of Oahu in the Territory of Hawaii. The green fairways and roughs sloped down to the post proper, which seemed to be peacefully dozing on that lazy Sunday morning. I recall the sky as being mostly clear with a few lacy clouds dotting the blue bowl. From the deck, Schofield Barracks proper was directly in front, a mile or two away. Wheeler Field, the U.S. Army Air Forces pursuit base, was to the right of the barracks, perhaps three miles away. Wheeler Field was not as peaceful as Schofield. In the sky above Schofield was a circle of aircraft. They flew counterclockwise with one side of the circle approximately above Schofield, the other side near the edge of Wheeler Field. The aircraft coming in my direction from Schofield curved around in front of me, flying perhaps a thousand feet above. I could clearly see red circles on the wingtips and the fuselages. It was a strange insignia to me. As the aircraft curved around toward Wheeler Field some of them began a slow descent, which became steeper and steeper as they approached the hangar line. I was quite familiar with the hangar line at Wheeler Field, having served there as a communications technician for a year before transferring to the 11th Tank Company at Schofield late in the spring of 1941. Clouds of black smoke boiled up from Wheeler Field above the hangar line. From the attacking aircraft I saw objects dropping away, curving down and exploding in bursts of flame. In front of the aircraft, tiny incandescent spots slashed one by one toward the ground. I suddenly realized these pinpricks of light were tracer bullets and that each, when I knew where to look, left a delicate trace of smoke marking its path. I knew that for each tracer I saw four or five rounds I could not see were following. And I knew that most of the enlisted personnel on the ground at Wheeler lived in tents or thin-walled wooden shacks close behind the hangar line, opposite the runways and parking apron for the fighters. I knew many of these men. A few I considered friends. Only minutes before I had been lying on my bunk reading a copy of the Honolulu Advertiser. Earlier I had eaten breakfast in the mess hall and then, carrying my copy of the paper, had returned to the third floor of the barracks. My bunk was at the window end of a large squad room with some 40 other tankers. Most of the bunks were empty. Some, whose occupants had spent the night off the base, were still made up for Saturday morning inspection. Against the wall between the windows stood a row of green lockers. At the foot of each bunk was a green footlocker, a small trunk on a wooden rack that raised the locker to about waist height. Between the foot locker and the wall locker all of my earthly possessions were divided: uniforms, shoes, socks, underwear, toothbrush, razor, soap, a book or two, letters from the outside world, any money I might have had, other small odds and ends. Actually, the lockers, wall and foot, and the blanket on my bed, were all a color identified as “olive drab,” adopted by the Army prior to World War I. It was a depressing color, but I had become so inured to it I no longer noticed. Since it was after breakfast and I had no scheduled duty, I had turned on the small radio in my wall locker and, as I read, half-listened to a news broadcast that originated in Honolulu. Then I became aware that I could hear what sounded like distant thunder. I left my bunk and ran out to the deck to the scene I have described. A corporal stood beside me. “Those are real bombs!” I said. He was quite calm. I had heard that Marine Corps aircraft periodically ran simulated attacks on military installations on Oahu but had never witnessed such a drill. Just then I could see tracer bullets from one of the diving aircraft. The tiny dots of flame seemed to connect the aircraft to the ground. “Tracer blanks,” he said, still calm. There are, of course, no such things as tracer blanks. But I did not argue the point. I returned to my bunk, found my cap, buckled my pistol belt with its empty holster about my waist, and listened for a moment to the radio announcer. Again, there was no panic in his words, but he did warn repeatedly that Pearl Harbor was under enemy attack. I believe he spoke of the rising sun insignia of Japan on the aircraft. He warned that civilians should avoid Pearl Harbor since it was both dangerous there and in the streets nearby but also that crowds of civilians were beginning to interfere with military personnel in their efforts to repel the raiders. I am not certain that I turned the radio off before I went down the back stairs. I have, in the years since that Sunday morning, thought about that radio announcer. I do not recall his name. The thing I still find rather remarkable is the lack of confusion in his words. He did not doubt the truth of what he was saying. He was certain that the U.S. Pacific Fleet in Pearl Harbor that morning was under attack by an enemy he thought was probably Japanese. He was certain that he was not witnessing a drill. He identified the insignia on the aircraft as the rising sun. I think he must have been at his microphone in an area in which he had a clear view of Pearl Harbor and was close enough to see the insignia. I think he must have been elevated somewhat above so that he was looking down at the scene he described. He knew the sounds of impact and explosions of real bombs and torpedoes. I did not, at the time, think those thoughts. It is only in later years that these things seem significant. How could he be certain? He must have been a well informed, alert individual in the right place at the right time, if it is possible to label that time and place as right. My .45-caliber pistol was locked in an arms rack in the basement of the barracks. At the ground floor I went through a hallway to the orderly room. The arms racks, I learned, had been unlocked. I went down to the basement floor and found my pistol, then joined a line to be issued live .45 ammunition. I loaded the pistol clips and then slipped a loaded clip into my pistol. 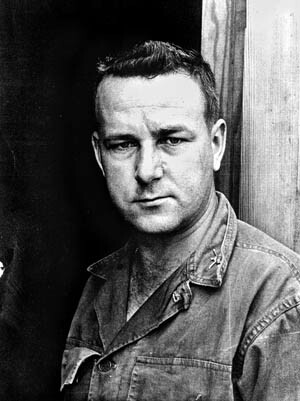 The author in a photo taken sometime after the Pearl Harbor attack. I was, at that time, assigned as radio operator and .30-caliber gunner of the number one tank of the 1st Platoon. Somewhere along my path I encountered the tank commander, Smith, a sergeant, a Tarheel from North Carolina. Together with the tank driver, Moder, a corporal from Kansas, we ran the 200 yards from the barracks to the tank park, an open-sided, tin-roofed, concrete-floored shed located downhill toward the edge of the golf course. Inside the long shed the company’s tanks were lined up side by side. Smitty unlocked one of the twin turrets of our tank, and the driver crawled inside. 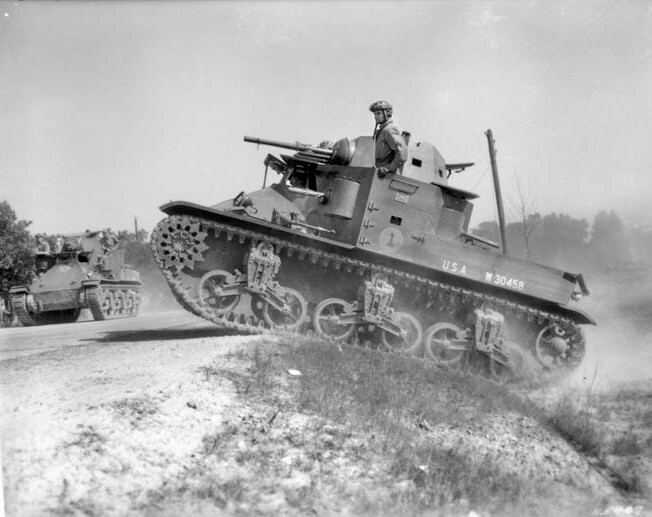 Officially the Army referred to our tanks as M2A3 light tanks, but throughout the Army they were known as Mae Wests. The twin turrets that topped the tank hull each contained a machine gun, the larger turret a .50-caliber and the smaller a .30-caliber. The tank commander occupied the .50-caliber turret. As radio operator, I crouched in the smaller turret and was responsible for the .30-caliber gun and the radio. To start the tank engine, a radial air-cooled aircraft engine adapted to tank installation, it was necessary to wind up the starter. Smitty and I ground the inertia crank as Moder, in the driver’s seat, listened to the whine of the starter. As it reached the proper pitch, Moder engaged the starter solenoid. With a cough the engine started. As was customary in prewar Hawaii, our machine guns were in turn locked up in another location, a smaller shed near the tank park. Smitty led the tank toward the arms shack. I ran over and found the door locked. The keys, I remembered, were kept in the orderly room inside the barracks in the possession of the NCO charge-of-quarters. The small group waiting for the door to open grew in size. We had just decided to force the door with a handy crowbar when another tank commander arrived with the keys. We hurriedly carried our guns to the tank and loaded them into the open turrets. Moder drove to a hastily assigned platoon deployment area next to the golf course. During this time we could look down on Schofield and watch the undisturbed circle of aircraft. The sounds of bursting bombs continued for probably another half hour, although I did not have a watch and was not aware of the exact time of events. Some of the Japanese raiders, evidently having exhausted their bomb supply, strafed Schofield as they saw Army personnel on the ground. Separated as we were from the main base by the golf course, those of us on the slope did not, I guess, appear to be worth an attack. However, aircraft passing overhead dropped empty brass cartridges and small metal clips that linked the cartridges together to form a belt of ammunition. All of the tankers, I think, picked up such souvenirs during the day. The Japanese characters imprinted in the bases of the spent brass were strange and incomprehensible. However, the fact that we were under attack was quite clear and convincing. Smitty, Moder, and I worked to mount the machine guns in the turrets. We knew that there was no ammunition ready for the guns. Moder and I went back to the barracks to load single rounds of ammunition into belts. I spent most of that Sunday morning and afternoon in the basement supply room loading machine-gun belts. The .50-caliber belts were relatively easy to load. Metal links, much like the Japanese links that were dropped down on us, and the large caliber rounds were laid in parallel rows side by side on a loading machine. Then a levered handle was operated, forcing the cartridges into the links and forming the belt of ammunition, ready for firing. The .30-caliber belts were much more frustrating. Unlike the Japanese metal link belts, we used cloth belts, parallel ribbons of white or green fabric stitched together at intervals just large enough to hold a cartridge. The loading machine had a feed gate in which the cartridges had to be exactly aligned. A small hand crank caused a gate to open and drop a cartridge down to the belt level. Geared also to the crank, needle-lined jaws were forced into each side of the belt and, in theory, held open a space between the lines of stitches. Another gadget shoved the cartridge into the belt opening. That was true if things worked properly, which did not happen often. The loading machine was too intricately designed to do a reliable job. We were forced to manually examine each loaded belt to be certain that each round of ammunition was properly seated in the cloth. Then, at a rather alarming rate, we spotted rounds that had been misaligned by the machine, rounds in which the .30-caliber projectile had been driven back into the cartridge brass or bent sideways. Each of these had to be removed and a new undamaged round forced into the faulty round’s place. But we worked on, not knowing when we would need the ammunition. Rumors of landings by enemy infantry on the island reached us. We worked harder. As belts were loaded we draped these around our necks and carried them to the tank. There Smitty took each belt and stored it in the ammunition racks inside the tank. By noon there were no more enemy aircraft in the sky. We worked on through lunch. A field kitchen with a portable stove had been set up near the tanks. I never went back inside the barracks mess hall. An endless afternoon passed. My fingers were raw and torn from loading the belts. A flight of Boeing B-17 Flying Fortress bombers arriving from California was caught in the midst of the Japanese attack on Pearl Harbor. Several of the planes sustained serious damage or were destroyed. This photo taken at Hickam Field shows at least two of the bombers after their landing. We did not get to listen a great deal to the radio that day, but we did hear enough to understand the situation. At no point during the day did the company officers attempt to brief us. Probably the officers knew no more than we, but we knew that we were restricted to our company area. There were no passes given to anyone, and slowly those off base straggled in and changed into fatigues, the uniform of the day. We knew from stories on the radio that Pearl Harbor was a disaster. Before a security cap was imposed we had heard of battleships capsizing or sinking in the harbor with reports of hundreds of deaths on board, in the water, and ashore. 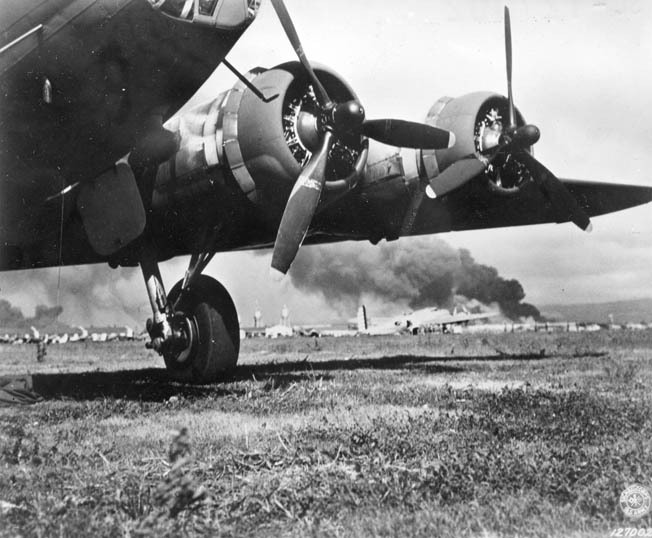 Hickam Field, the bomber base, was described as being dotted with burning aircraft, as was Wheeler Field. Rumors were rampant. Reports of infantry landings were constantly repeated, but we also knew that the attacking aircraft were gone from the air above Oahu by noon. We heard that the entire fighter force at Wheeler had been destroyed. On Saturday morning at the end of the usual apron inspection, the ground crews had started the engines and moved the fighters off the hangar line to the revetments along one edge of the field. The revetments were dirt walls about 10 or 12 feet high so that two aircraft were parked together in an area protected on three sides from attack. This protection was not perfect, but an enemy would have had to bomb or strafe separately for each two aircraft if they were in the revetments. However, at just about noon on Saturday, a new order came to the ground crews. Move the aircraft back onto the aprons. So back they went, wingtip to wingtip. Row after row. And there they were destroyed. Later we heard that six aircraft were found that could fly after the attackers departed. One of the Wheeler Field squadrons had moved to a temporary landing strip at a beach on the southwestern edge of Oahu to participate in live firing exercises. Since this squadron was not attacked it was assumed that the Japanese did not know its whereabouts on December 7. Some of these pilots took off that morning and challenged the attackers. We heard all these things. We also heard that Navy personnel were trapped inside the capsized ships in the harbor. Welders were trying to cut holes in the battleships’ armor. In December, darkness came early. I was carrying a load of ammunition to the tank after dark. Just as I came to the tank park the air was filled suddenly with snapping bees (bullets) cracking viciously as they passed overhead. I was alongside a line of oil-changing pits for the tanks. Panting, I dropped to the floor of a pit oblivious to the coat of oil usually in its bottom. Afterward, in the darkness each platoon had a roll call. No one was missing or injured. A Japanese aircraft soars high above one of the naval air stations located on Oahu. During the day a regiment of infantry from Schofield had occupied an open field across the road from the golf course. These nervous men had been startled by some noise, probably caused by a tank, and one man had evidently fired his gun. Quickly, the others had joined the firing. Fortunately for our side of the road, they were firing over our heads, but I did not leave the pit for some time. We could hear the officers and NCOs of the infantry regiment trying to control their men. so beware, bee eee eee ware! We had evaluated our commanders and found them wanting. Some historians have taken many hours of research and pages of text to do the same thing. Dated November 27, 1941, Admiral Husband E. Kimmel, commander of the Pacific Fleet, had received a communication from Washington. It began: “This dispatch is to be considered a war warning.” The rest of the dispatch did, indeed, deal more specifically with the Japanese threat to the Philippines and in Far Eastern waters. I would have concluded, I think, that the writer of the communication was trying to warn of the imminence of war with Japan. Not so the admiral. He decided that the warning applied to the Philippines rather than Hawaii. General Short received, in effect, the same warning. Short decided, apparently, that the message warned of sabotage threats from the Honolulu Japanese community. A sabotage alert was put in effect for the Army, although I was never personally aware of it. Short and Kimmel had the military responsibility for their commands, and this responsibility could not be delegated or avoided. We came to that conclusion on December 7, and I have never seen reason to change my attitude. In the aftermath of the Pearl Harbor attack, U.S. Marines and soldiers stationed across Oahu were nervous and often fired at anything remotely suspicious. 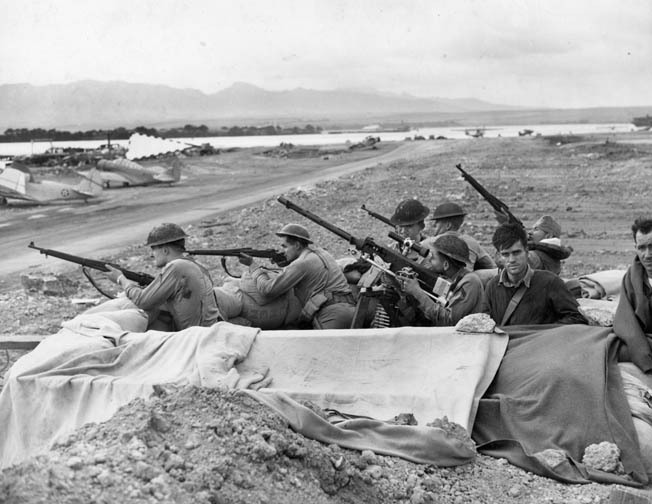 These troops man a sandbag gun emplacement adjacent to an airfield, their rifles and machine gun at the ready. During the day, while Moder and I loaded machine-gun belts of ammunition, the 11th Tank Company had been deployed on the edge of the golf course to the right side of the road that led downhill to Schofield. After a break for supper, which we ate from the field kitchen in our mess kits, we continued our work until after dark. It was then, as I was carrying ammunition to the tank, that I was driven into the oil change pit by the infantry fire from across the road. Sometime around 10 pm, a verbal message came down to us at the tanks. At exactly 12:30 am, or 0030 military time, a Curtiss P-40 fighter plane would take off for a reconnaissance flight from Wheeler Field. The aircraft would fly over our area. It would have all lights on, and we were not to shoot at it. Smitty, who was to be on guard, would wake me shortly after midnight. It had been a long and demanding day. Rumors of enemy landings circulated through the ranks, but with my bleeding fingers I crawled under the tank and went to sleep. I awoke to Smitty shaking me. It was nearly time. Moder and I crawled out and tried to ease our stiff muscles. Then we heard it. I looked off toward Wheeler Field. We saw the landing lights first. The twin beams lighted the sky ahead of the P-40. Then we saw the red and green blinking lights on the wings. We could see the aircraft clearly. Gaining altitude slowly, it came closer. Then it was overhead. Thinking of the infantry in the next field I waited tensely. The aircraft was perhaps 500 feet in the air. As the plane passed over the roadway the first rifle was fired. Immediately the sky was filled with tracer bullets. Sick, fascinated, I could not turn away. A flame broke out from the plane’s engine. As the flame grew the aircraft turned gently toward the left and began to lose altitude. Then, with a whoosh flame engulfed the fuselage. The plane rolled over and began a dive toward the ground. We saw the flash of the explosion and seconds later heard the sound. For perhaps half an hour we watched the flame burning on the side of the mountain range. Across the road a vast silence prevailed over the infantry. The next morning I awoke to a wartime future. Among the tanks, we stared vaguely at each other. The realization that there was no way we could avoid the war came over us. Well, I had no other plans, anyway. Surprise is defined as an event in which one encounters something or someone suddenly and unexpectedly. It causes one to feel wonderment or amazement. Certainly, the Japanese attack on Pearl Harbor on December 7, 1941, caught the U.S. Navy and the U.S. Army by surprise. A surprise of the magnitude, the audacity, of the attack on Pearl Harbor also generates a great well of confusion. It seems to me, in 1997, all of 56 years after the event, that we should never have been surprised. That we should have been confused as a result of the surprise was inevitable, but we should never have been surprised. Hundreds of thousands of words have been written about the raid on Pearl Harbor. Quite often a writer recounts what he or she was doing at the moment he or she became aware that the raid had occurred. Usually those who were present or close enough to witness the events create a narrative of what occurred and what one did and said. Quite often, as happened with the corporal with whom I had the brief encounter on the rear deck of the barracks, the first reaction is disbelief. 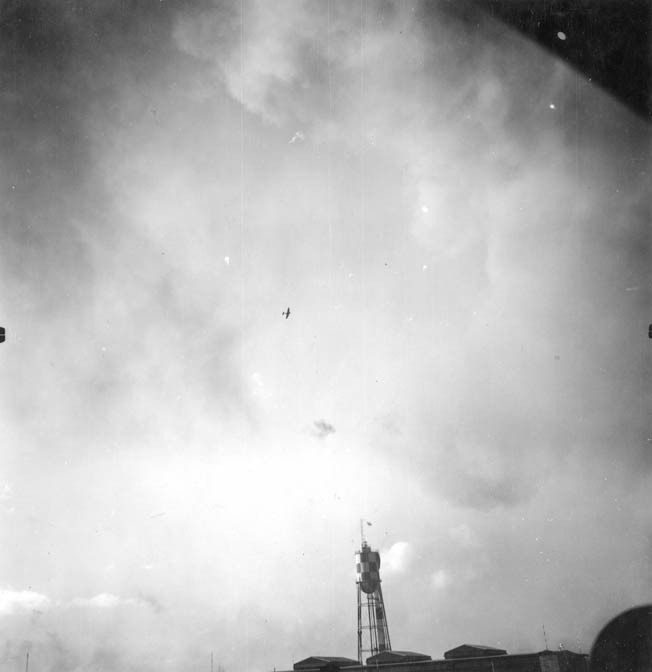 If the corporal had been careful enough to assess the flames and the smoke rising from Wheeler Field or to watch the bombs clearly separating from the aircraft, dropping downward, and impacting with bursts of flame, he might have reached a different conclusion. He had been there, seen that. It was the Marines. They were dropping sacks of flour. The whole thing was an exercise to test whether or not our troops were ready. I had been listening to the Honolulu radio announcer and was ready to accept his words about the attack on Pearl Harbor. The corporal had not been listening. It was an event he had seen before, and he could not shift mental gears that abruptly. I do not want to judge the corporal too harshly. In the months following the attack he sought a transfer to a bombardment squadron at Hickam Field, was transferred, and was a crew member in a B-17 bomber from Hickam Field, which was deployed in the defense of Midway in June 1942. He participated in a battle not only crucial to U.S. interests, but also at a time when morale was at a low point in the United States. My reasons for believing that we should never have been caught by surprise that Sunday morning are, of course, the various warnings our commanders had, the misinterpreted November 27 “war warning” messages to the Army and Navy commanders, the known presence of Japanese submarines near the entrance to Pearl Harbor that morning, the early warning radar detection of the approaching Japanese air attack group. In reality, neither the submarine activity nor the tracking of the approaching air attack group made its way to either the naval commander or the Army commander through the intricate channels of communication from the bottom to the top levels of the command structure. However, such a state of affairs is again the responsibility of the commanders. The capsized hull of the battleship USS Oklahoma lies in the shallow water of Pearl Harbor. The Oklahoma was hit by several Japanese torpedoes, causing the ship to capsize and trapping a number of sailors below decks. Feverish efforts to rescue the trapped men were only partially successful. The “war warning” message alone should have completely alerted our armed forces throughout the world. Instead we slept. The submarine alert and the radar intercept would have, if properly treated, given the ground forces a chance to fight off the attackers with some degree of equality. The Army’s antiaircraft capability around Honolulu and Pearl Harbor was considerable but got no chance to show its strength during the first wave of the raid. In addition to these neglected warnings, I recall other things that seem worthy of attention. Not many enlisted men bothered to read the newspapers or listen to news on the radio. I do not know now why I should have been concerned, but I must lay claim to spending a good deal of my spare time reading. Now in my 80s, I still tend to pursue this vicarious reality and shall probably continue to do so as long as my eyes permit. I did read the Honolulu newspapers regularly on Sunday mornings. What I recall from the approximately six months prior to the attack is that two or three Japanese nationals, men with families, were interviewed on their departures from Honolulu to return to Japan. I remember at least one of these men as being quoted to the effect that the Japanese government had recalled him as a reservist to active duty for a probable conflict with the United States. I also remember a Sunday when I was still a member of a pursuit squadron at Wheeler Field. About midmorning I strolled along the hangar line, where all the fighter aircraft were lined up wing tip to wing tip, toward the northwest end of the field and the line of newly constructed revetments. Near the baseball diamond a model airplane competition was under way. Several hundred people, civilians as well as military, milled about. Single cylinder miniature engines lifted models aloft with timers busily tracking the planes’ performances. Rubber-band-powered models climbed up, then floated about. In the crowd below were many civilians with Japanese 35mm cameras. They wandered freely about, photographing the models and also, I am certain, the military aircraft, the hangars, the parking aprons, the administration buildings. I feel certain that many of these photos found their way to Japan—and probably within a short time. I am not accustomed to seeing spies in every corner and under every bed. But they do exist, and I think the military installations on Oahu in 1940 and 1941 were easy targets. In the 1920s and 1930s, as I recall, an almost universal attitude among Americans about the Japanese people was that the Japanese were copiers of American technology. The Japanese, it was believed, were unable to develop concepts, to invent new devices such as cameras or airplanes or automobiles or refrigerators or battleships or aircraft carriers, but they were quite adept at copying these things. None of their copies, we were convinced, were as good as our originals. John Sanford Baird was a gunner in an M2A3 “Mae West” light tank, and his unit mobilized as quickly as possible on the morning of December 7, 1941. It made little difference to us that the cameras we used, the better ones, came mostly from Germany. We thought of them as ours. We considered our airplanes to be the best in the world in 1940. We thought the P-40 to be the most advanced fighter aircraft in the air, able to outperform any other aircraft it might encounter. We thought our aircraft carriers to be unequaled in any other Navy and our battleships superior to any others. We considered the American culture, if such there is, superior to any other in the world and, specifically, it was infinitely superior to Japanese culture, and you could include the Chinese and other Asians in that category as well. On Thursday, December 4, 1941, Senator Owen Brewster said in a public speech, “The United States Navy can defeat the Japanese Navy at any place and at any time.” Among famous last words, these must be the least famous. Certainly, December 7, 1941, was one of the worst defeats the United States has suffered. We soon learned that the Japanese Army and Navy fought fanatically wherever we encountered them. They were taught that to surrender was to destroy their honor. But we did not know those things on December 7, 1941. I recall once telling a friend fatuously that the Japanese nation had committed national suicide on the day they attacked Pearl Harbor. Tags Allies, attack on pearl harbor, Axis, Hawaii, Japan, Japanese, Pacific Theater, Pearl Harbor, pearl harbor attack, RADAR.